Our intrepid scribe is back for another run through the college-gridiron gauntlet. 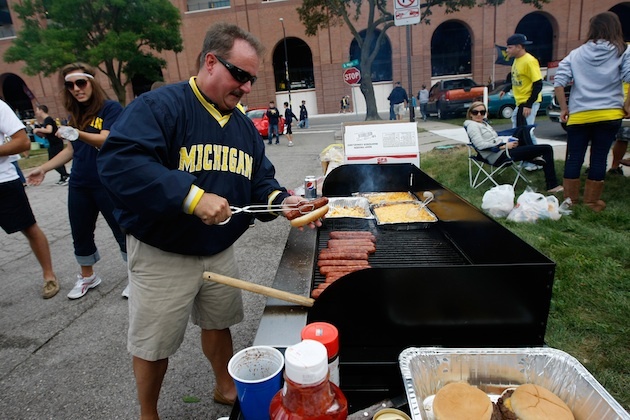 The scene: Ann Arbor, Michigan, after the Wolverines' loss to the Spartans. In the three weeks since being choppered out of Bryant-Denny Stadium in the war-zone wake of Alabama’s crippling loss to Ole Miss, I’d done all I could to banish football from my brain entirely. So total was the shell shock, I was prescribed a daily regimen of three-hour mud baths and listening to Beach House. It didn’t work. 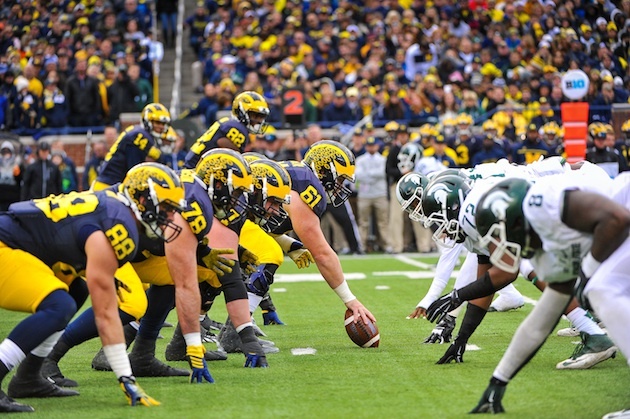 So when my editor approached me with the idea of covering Saturday’s poll-shaking slog between Michigan and Michigan State, I made my hesitations known. And so, like a once-burnt moth drawn back to a bug-crusted bulb, I accepted the assignment. I was off to Ann Arbor—college town extraordinaire, bastion of football tradition, exemplar of Midwestern progressivism—for what, despite the intrastate stakes, was sure to be a comparably civilized, decidedly explosion-free affair. It was the smoke-spewing money printers and flesh-eating marmots I didn’t think to account for. Early Saturday morning, I’m met at the airport by longtime Michigan booster Wilbur J. Prudholm, founder and CEO of GoBo, a company that sells Bo Schembechler's stem cells to alumni in need of highly advanced in-vitro fertilization. Decked in a navy suit replete with Wolverine regalia—two-tone tie, block-M lapel pin, wad of gold-clipped cash in place of a pocket square—Prudholm is blue-blood booster through and through. One of my demands for writing the story was a guarantee I’d be flanked in my travels by functioning adults, rather than three-toothed Southern savages masquerading as college students. For all his over-starched pomp, Prudholm was, it seemed, someone I could count on to navigate me through the day—the sights and sounds, the city and scene—with a minimal risk of death. After a brief exchange of pleasantries, Prudholm guides me into his black Cadillac XTS, gleaming high despite rust-belt gray. Not two seconds after I shut my door, I'm jarred to near-stroke by a loud screech and rattle blasting from the back seat. I twist around instinctively, half-convinced the ghost of some Alabama blue hair had come to gum my soul into oblivion. 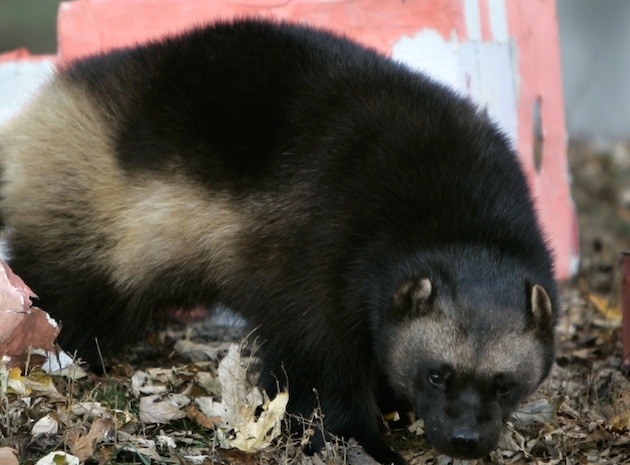 There, in a large cage lined by a small maize-and-blue blanket, stood a full-grown wolverine, fangs bared and tearing around in a kind of flesh-lusting seizure. “Is that a f------ wolverine?” I implore, heart now restarted. As far as first impressions went, sharing a Cadillac with a giant meat-eating weasel wasn’t exactly what I’d had in mind. So much for a low-key Saturday, I thought. By all outward sheen, the Go Blue House is like any number of late 19th-century Victorians peppering Ann Arbor’s leaf-charmy lanes: stately-handsome but modest, at once timeless and deeply steeped in it. Everything, from the clean-kempt grounds and molting maples to the flawless façade, feels immaculate—a dollhouse raised to scale. I exit the Cadillac and wait as Prudholm opens the rear passenger door, unlocks the cage, and leashes Greasy. She plops onto the ground and, upon seeing me, immediately recoils in a teeth-gnashing crouch. “Seems like she hasn’t been around people very much,” I offer, hoping in vain the thing might chew threw its leash and lunge straight into oncoming traffic. I follow them to the front door, keeping Greasy 20 feet in front of me at all times. I know what's going to happen before Prudholm even presses the door bell: the same studio version of Hail to the Victors I’d been hearing on an endless loop the entire 40-minute drive. The door opens midway through the first verse. On the other side stands one of Prudholm’s suit-clad colleagues, martini in hand and what looks—and smells—like a clod of French-onion dip resting on his mustache like windshield birds---. “Hail!” dip-stache screams through a salute. This exchange lasts roughly 20 seconds, and ceases only when Greasy—growling all the while—lunges snarling in my direction, snapping Prudholm out of his salutary stupor. Inside was a Norman Rockwell Quaalude-painting of a Bilderberg meeting. Lacquered mahogany abounded, with a tuxedo-donned server pushing around a wheeled bar stocked with crystal pitchers and steel bowls of highball cubes. "I've about had it with these Ingham County rubes passing themselves off as a top-tier research school. We produce doctors, lawyers, leaders of the free world? State? What have they given us? Magic Johnson, some Zombie snuff film director, and 3,000,000 mouth-breathing freeloaders. One of my daughters went there to visit a cousin, said she saw some girl eating pizza with her hands. Her hands! With Greasy now safely locked away, I focus on getting to know my high-rolling hosts. Most of them have deep Michigan ties, with many—including Prudholm—tracing their roots to the school’s founding in 1817. Setting aside Greasy’s clear longing to remove my throat, the Go Blue Club gathered were exactly what I hoped they’d be: Straightforward, professional (if a bit cryptic), and refreshingly averse to wonton means of self-destruction. Whatever their quips and qualms, these were men smart and seasoned enough to rise high through life’s twisting ranks; men of culture and knowledge; men of pride, in wares as well as work; Michigan Men, proven and pure. Just as Prudholm was finishing his family tree soliloquy, a pair of double doors flew open across the room. From behind them surged a dense plume of what looked like $100 dollar bills, which dissipated to reveal yet another suit-stuffed surrogate standing half-panicked in front of a giant, smoke-whirring machine. In Tuscaloosa, my football-tailgate experience was marred by alligator races, barbecue smoked in old refrigerators, and wheel barrows of cloudy, sediment-filled alcohol. I walked within feet of no fewer than four guns I had no idea were about to be fired. Ann Arbor, by comparison, felt measures more reserved—the nondescript autumnal harvest-scape to Alabama’s acid-addled ode to Peter Bruegel the Elder. That’s not to say Tree Town was without its quirks and curios. As my Go Blue Club guides and I were making our way to the Stadium, for example, we happened upon a rather large contingent of rasp-vocal war protestors, all of them marching in the opposite direction. Considering the city's reputation as one of the most progressive in the country, such sights are, of course, far from uncommon. Even if the signs—“Stay out of Kuwait”; “We Supported Saddam”; and “It’s 1991—Let’s be one”—felt a touch dated. The Go Blue Club, by now re-suited in matching maize sports coats, dark-blue ties and matching Shriners-esque Fezes with—so they tell me—Denard Robinson dreadlocks in place of tassels. We’d been safe in our seats for a solid 20 minutes by the game’s 3:30 kickoff—tipsy, but not totaled, ebullient but for the nerves. From go, the tension was steel-ply and palpable, particularly for the tens of thousands of Michigan faithful desperate for a rivalry respite. I’m seated between Prudholm and Szezniak, in a row of primo seats 11 rows above the 40-yard line. Burt, meanwhile, stands directly behind me. “Did you play with helmets when you were a kid?” I ask, trying to change the subject. 1920s euphemisms now checked off the to-do list, our focus shifts back to the game. Following a physical first-quarter stalemate, Michigan weathered two goal-line stands before punching in a two-yard score to take a 7-0 lead (all three plays, like 57 others that followed, were put under review). After a pair of punts, Michigan State drew even with an 11-yard scamper by freshman stud L.J. Scott. The Wolverines would add a field goal to go up 10-7 at the half, in what was shaping up to be—in both score and spirit—one of the tightest Civil Wars in memory. UM fan to MSU fan: "Excuse me, I think the broken toilet is in the other concourse." MSU fan to UM fan: "Son, I’ve sneezed more beer than you’ve drank." UM fan to MSU fan: "You know who else was in favor of land-grant schools? Hitler!" MSU fan to UM fan: "I see you two are engaged. Lemme know if you need a sack of cow s--- to keep the flies off your bride." 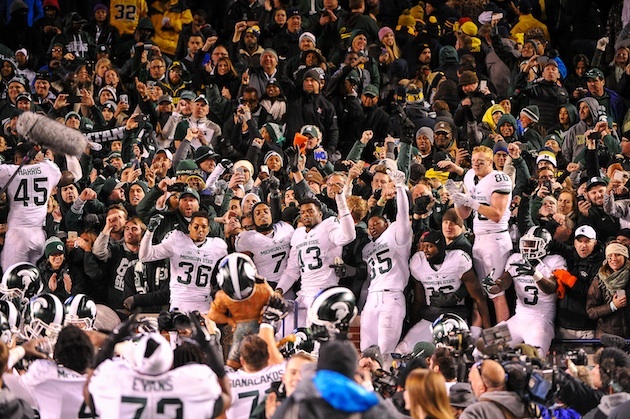 UM fan to MSU fan: "You know what the most useful thing ever to come out of East Lansing is? I-96!" MSU fan to UM fan: "I am going to throw up on you now." Phone filled with booze-induced barbs, I returned to my seat a few minutes ahead of the second-half kick. Prudholm and Szezniak were commiserating with a group of friends a few rows up while Burt—game program draped over his head like first-class steam towel—was snoring dead to rights. “Burt,” I said, shaking him gently. His head snapped awake, sending the program flying forward. Before I know what was happening, he had me pinned to his seat in a violent chokehold. After a few more seconds, Burt finally relented, helping me up and letting me return to my seat. Prudholm and Szezniak returned soon thereafter. After a Michigan punt and turnover on downs from MSU, the Wolverines struck again on Sione Houma’s second one-yard run of the day. But Connor Cook wasted little time on the ensuing drive, connecting with MacGarrett Kings on a touch-perfect 30-yard strike with 7:07 left in the third. Coupled with a pair of Michigan field goals, Sparty’s inability to find an offensive rhythm had them looking like a fast-reeling team. Not to be outdone, Cook struck again, this time on an absurd 74-yard wheel route to seldom-used fullback Trevon Pendleton to set up one-yard burst from Scott. Following a three-and-out and subsequent Wolverines punt, Cook—sacked for a nine-yard loss on first and 10 from the 36—failed to connect on the next three attempts. As Cook’s duress-addled fourth-down toss sailed wide of a falling Kings, it looked as if Sparty’s reign—six wins in seven years and bragging rights from barroom stool to Pentecostal pew—seemed doomed to dustbin. “We did it, Glen!” Prudholm tells Szezniak as the two embraced around me. “Michigan’s back, baby! No more Ronco Beef Jerky Machine and Complimentary Knife Set Bowl for us! I can finally fly my school flag without the landscapers laughing at me!" “Yes, sir!” Szezniak responds in verve. Naturally, Prudholm and Szezniak brushed off their elder’s warning. Even when Michigan failed to notch a game-sealing first down on the subsequent possession, the game—all ten seconds and 44 points of it—seemed aimed for ice. We were all watching as the ultimate snap sailed through the legs of Michigan’s center and towards the waiting hands of Blake O’Neill, whose Aussie laser leg nearly single-footedly won the field-position battle. We all gasped in stadium unison when the ball bounced perilously off O’Neill’s hands and towards the bull-rushing Spartans. Watts-Jackson breached the plane of the end zone just as time expired, giving Michigan State not only the most unlikely win in the rivalry’s hate-steeped history, but one of college football’s all-time bats--- endings. 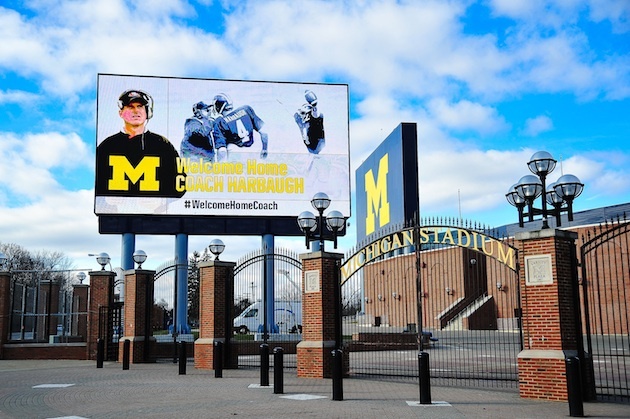 Not that any Wolverines fan was thinking about this, of course. At that point, with the din of defeat fast descending to despair, all I could think about were my gracious chauffeurs. They may have been iniquitous legacy brats with a penchant for money laundering and criminal recruiting tactics, but monsters? Hardly. 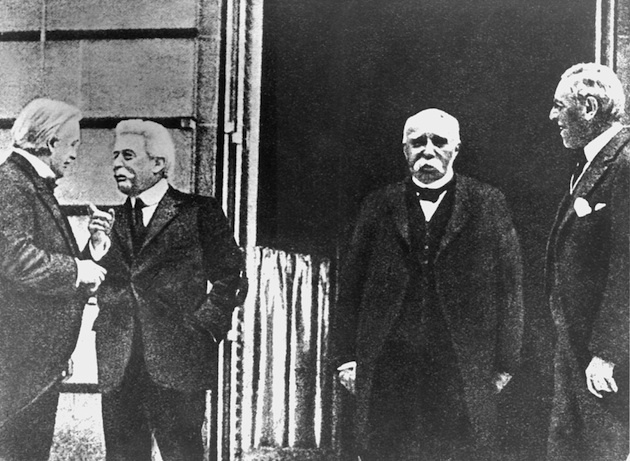 Szezniak was the first to speak. The two joined the tens of thousands around them in staring in stunned silence at the Spartan celebration. In a few minutes, people would begin to file out, cold and empty, their despairs ghosting in tow. They would stumble, stagger, and waddle their way back to cars and homes, ravaged by a rage known only to those fans most invested in the woes of foes. By Monday, they would be as zombies: alive in gait and gaze, doornail dead inside. A few minutes later, Prudholm, Szezniak, and their Go Blue cohorts began collecting their things—hats, programs, T.J. Duckett voodoo dolls—and preparing for the solemn stroll back. Only Burt remained motionless, his head hung as if to count the scuffs of his shoes. He wasn’t asleep this time, so much as mired in catatonic murk. Finally, Prudholm decided to summon his senior from the spell. The old man lifted his head, looked at Prudholm and, with the resolve only a hero of hellmost war could summon, answered this question with one of his one.